I thought I would check in and say that I am so, so busy right now so have little time for blogging and reading!! I am knee deep in taffeta working on this wedding commission, the deadline of which is looming and I have some family stuff going on right now which all together means I am more than a little distracted and exhausted. I will be back next week with an etsy retreat to report on and hopefully some actual work to show you!! Wow - and wow again!!!! Good morning my dears!!! I hope the week is going well for you and the sun is shining. Here in The house of Gilfling I am suffering all sorts of aches and pains and tiredness I am afraid. Mostly self inflicted due to me waking up yesterday morning and deciding that I absolutely have to do something about my weight. Not that I mind being curvy of course (I rather like it!) but blobby, well no that just will not do. Of course I need to lose weight for the sake of my poor old decrepit spine too. So I got up and immediately got on the stepper which has been collecting dust since way before we moved and then did exercises on my pilates ball as well as some floor work. Well I can tell you I am now acquainted with all sorts of muscles I had forgotten I even had. Also a complete inability to get any sleep last night led me to come down to the sofa where of course I drifted into a very unsettled and very contorted sleeping postition...and now... oh boy I am feeling that! Right - enough of my mutterings about nonsense. I am over the moon this morning as I woke up to find that the results of the etsy poster competition were in. You may remember I submitted my own entry from this post. Well etsy were overwhelmed with submissions (almost 1000 I think) and in the end 60 lists have been chosen to be printed up and used for etsy to give 'these posters away at fairs and festivals. 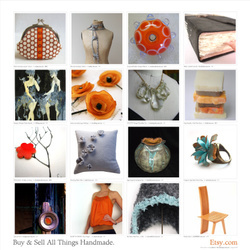 They will be used to promote the featured artisans, the artistic eye of our curators, and a hint of the beauty to be found at Etsy.' Well my own list was not chosen but instead 3 of my items have been featured in the winning lists!!! I am chuffed to bits to have my work represented in this way. So as a wee thank you to the wonderful sellers who chose my items to be featured in their lists I just want to feature them here. aussiepatches is an australian artist and illustrator with an amazing and inspiring blog which tells the story of her adventures in becoming a successful artist. Gosh this girl has gone far in a short space of time!! Her dedication and hard work are really paying off and her work is beautiful. 'Her girls' are full of life in bold colours and lines and each one has such a distinct character and mood. I am completely in awe of her skill at promoting her work and the range of opportunities she seeks out for herself. I think I could learn alot from this incredible artist!! 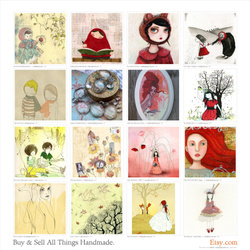 Have a look at her amazing etsy shop to see the amazing range of work. I certainly have my eye on a couple of prints for my home. I love the colours in her poster competition and am so pleased that my Into the Forest print was featured. PamelaAngus featured my most popular print Baroque, Baroque in her winning poster entry. An incredible stained glass artist originally from Ireland she is now located in France. I really am in awe of her work and her ability to transform glass into these amazing shapes. The colours are beautiful and I really have my eye on this piece called the Dressmakers Floor. Of course!! What could be more appropriate for my studio!!! Her description of the piece is just wonderful. 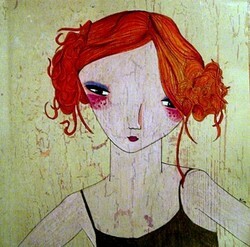 But how could I ever choose between that and this wonderful piece. Well if you know my work then you are bound to know of my obsession with angels - they do appear rather frequently!! So of course those Venetian Angel Wings would be right at home here. 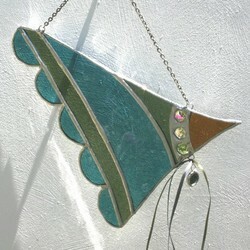 Please check out her shop too for her gorgeous stained glass pendants in all sorts of delightful colour combinations. So last but by no means least comes the poster list created by Skullknocker. Now I have to admit this is a completely new shop to me but look at these wonderful and colourful characters!! Made from recycled materials they are clearly lovingly and perfectly stitched. 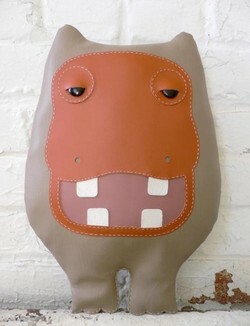 My favourite has to be this lovely character - Blythe Hippo. Just look at that lazy expression!! I love those colours too. Skullknocker featured my Memory of Annabel Lee print amongst the other beautiful items feature. What a great and varied list. So really I have to say thank you to these sellers. It is has really been heavy on my mind recently that I have to be more proactive in marketing my work but my silly lack of confidence gets in the way. I have so much to learn and don't really know where to start but perhaps this will give me the boost and motivation I need. I really have itchy feet at the moment - I feel as if I am on the cusp of something. Things need to move forward and I need to get my act together to make it happen. I just need to figure out where to start!!! But I had better get back to that wedding dress commission which is taking up all my time at the moment as the sooner I get that finished, the sooner I can get back down to my painting studio and pursue my real happiness! So cheerio for now!!! You can find a complete list of the winning entries here as well as honourable mentions and statistics. 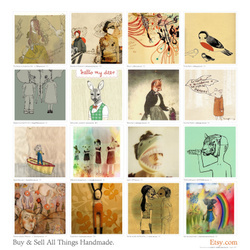 Take a look as there really is an incredible amount of etsy goodness and talent to see there! Good morning to you!! I hope you all had wonderful weekends, adventures, misadventures, relaxation time and general all round loveliness going on. My weekend mostly involved work as after having my family down to stay with us last week and my up and coming weekend away (more on that later) and the fact that I am still trying to catch up after the house move I really just needed to get my head down to some work. I had a wonderful day at my studio on Saturday which mostly involved me trying to get past the panic and fear of the work that I am trying to do at the moment (sometimes pressure is a good thing, sometimes it sends me into a state of panic - this is completely normal and I actually think in a way necessary for me - all part of the madness of the creative process) but it meant that I did loads of sketchbook work and I think that is what I really needed to do - I have a million and one ideas brewing for new artwork and this time of development is just as, if not more so, as important as the actual creation of the final pieces. I have a big project on the go at the moment which is really important to me and I really want to create my best work yet for it - I will be revealing details soon!!! I don't like having to be so secretive but I don't want to jinx it either! 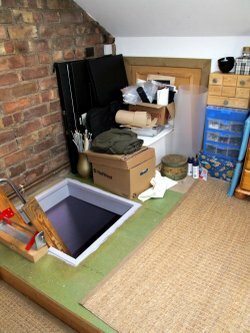 I think I may take some updated photographs of my painting studio as it has changed quite a bit in the time that I have been working there recently! 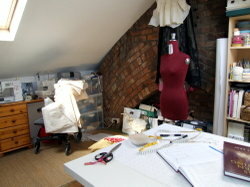 Yesterday was spent working in this lovely space which is my new loft working space!! 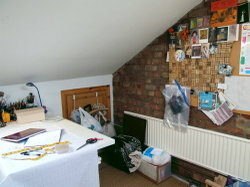 (Excuse the wonky photographs - the first one was taken from the ladders which lead up to the space). I have been so excited to show you this as I am really in love with it. It is a great room to work in on my commisions and costumes and as you can see it is just spacious enough to not feel cramped or overcrowded. However I really need to keep my painting studio too!!! Mark is exasperated with me at the moment as I had promised to give it up to help facilitate the house move but I have a whole room full of stuff down at the painting studio and the thought of bringing it all home to here and crowding this lovely room up with easels and tables of paint - well I just cannot bear the thought - I really need both spaces!!!! Does that sound selfish?? I hope it doesn't. The fact is I know how lucky I am to have either one and I adore them both. It feels like a good balance and I know that it is good for me to get out of the house to another space for a few days a week too. So we shall see what the future holds!!! I do apologise for the childish tantrum. 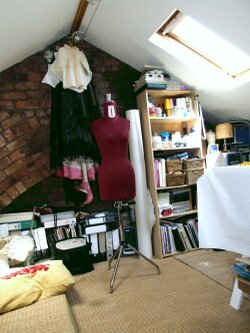 It's funny - I see so many photographs of beautiful studio spaces where everything looks as it has been placed there for a reason, it all perfectly co-ordinates, the shelves are stacked neatly, everything has it's place - and mine looks like a bit of a jumble compared to those!! But nevermind. I adore it all the same. Yes there are still boxes to unpack, yes there are those hideous but perfectly functional plastic storage boxes (I have yet to find the perfect, aesthetically pleasing but holds everything I want it to hold-storage solution) but this space functions just as it is supposed to. Perhaps it is my lack of photography skills that means this space does not look like those spaces I admire - as to me, this space feels just as wonderful as they clearly are! There are corners of this home that I am looking forward to developing and beautifying even more. The bedroom (the colour of which has taken me a wee while to get used to - but I am getting there) needs warm and inviting rugs and definitely more artwork. My small and ever increasing collection of vintage handbags will hang on the wall along with a selection of prints which I have yet to purchase (the heart is willing but the funds are low at present) and I am also playing with the idea of making a wonderful blanket for the bed - I just need to decide what form it shall take - crocheted afghan or ripple effect blanket such as the one here or my very first quilt - Mmmm decisions, decisions. I have never really had the space or had the freedom to have lots of things around me and to express myself by decorating my surroundings as much as I feel the desire to at the moment. Inspired by homes I see in blogs (I mean how can you not be inspired by homes and spaces such as this and this (and so many more) and all the wonderful creations I am constantly exposed to at the moment is really encouraging me to want to be much more expressive in the way that I view my home - so watch this space!! Well my dears...here we have it....my first proper and decent blog post in I don't know how long. Excuse the type and dash post of yesterday, I just had to write something, even just a little thing just to say I was still here and around. I am afraid you will have to excuse this rather self indulgent post!! Even though we have now been in the new house for almost 3 weeks I am still smitten you see. 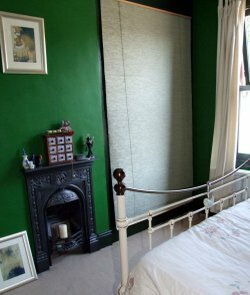 What a difference a 'homely' home makes and there is still so much to do. The move of course was inevitably a wee bit stressful but that has all been forgotten so quickly now that we are here and settled in. Can I give you a guided tour?? I would love to if that is Okay. Our living space is just divine, compact and cosy with an original fireplace - I think these properties were built in 1901 so we are lucky to have the original features. The evenings are wonderful in this warm room and I cannot wait to be lighting log fires in the winter! Would it be too much for me too point out little things as we go around?? Perhaps one or two? Well the bright cushion on the sofa was made by me many years ago when I went through a real phase of tapestry and I still love it - a hobbie I shall have to get back to at some stage (before retirement possibly!). 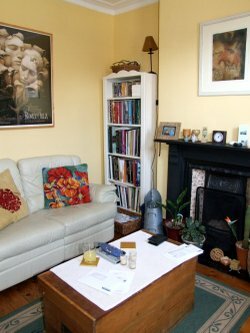 The poster above the sofa is a polish opera poster bought in edinburgh years ago and I have never been able to find anything similar since then. The framed piece above the fireplace is an original of mine which I cannot bear to part with. But I do have to mention that the print is available here (I am always slightly suprised that no copies of this piece have sold as i really is one of my favorites!) I am currently trying to decide on a few pieces of etsy art prints to add to this room but funds are low and there are too many to choose from!! I do need to get back to my artists features as I am desiring so many things at the moment to enable me to fill our home with a wee portion of the talent that can be found on etsy. So we move to the dining room! Mmm this room is proving a difficult one. The only place to house our rather bulky and modern computer desk which just takes over the room. We only have a small IKEA dining table and I am looking to get a larger antique one just to balance the room out and define the 'dining room' aspect more clearly. 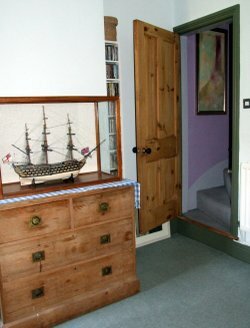 When we moved in I was so upset that my antique chest of drawers just would not go up the steep, low ceiling'ed and tight cornered stairs any which way we tried but there is always a silver lining!!! My dad and step mum visited from Scotland last week bringing with them what is now my most precious belonging. The Victory - a large ship my great grandfather made (one of very, very many ships) by hand. It took him 3 years of painstaking work and is the largest of the ships in the family. My very first memory was of him saying that someday this ship would come sailing to me and my dad thought this was the time for it to do just that. It is the first time in my life I have really had space for it. I am so grateful to have this substantial piece of furniture on which to display it. It just fills me with pride at what this remarkable man achieved everytime I look at it. He died when I was young although I do have some memories of him - most of all just how humble he was and that his huge hands could create such minute detail in these beautiful objects. Oh dear, so much writing and more rooms to go!! Perhaps just the lower floor today and then more in the next post? Yes that is the way we shall do it I think!! 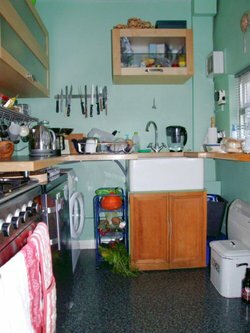 The kitchen - one of my very favourite rooms even though it is incredibly tiny!! So compact and yet everything we need. I am just going mad for those touches of red agains the serene green of the walls. 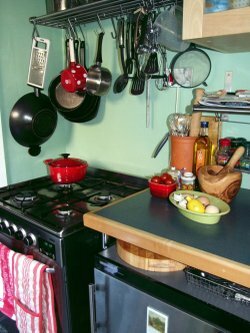 The heart shaped Le Creuset pot on the cooker was a wonderful engagement gift from my dad and step mum. If you haven't heard of Le Creuset look out for pieces - this does everything - you can use it in the oven or on the hob and in cast iron will last a lifetime - I know I sound like an advertisement but really - don't pass one by if you see it!!! Can you see the olive wood pestle and mortar - this too is a new addition - my birthday gift to Mark. Everything just fits so neatly in this room and I do adore it - can I say that enough??! I adore this house!!! A place for everything and everything in it's place. The organic veggies (yes I am still raving about those!!) on the rack, the freezer is in the cellar, extra cupboard staples such as tins and packets on the shelves going down to the cellar. Just wonderful. It is amazing as, as nice as our previous apartment was, it never felt anywhere near as home to me as this house does. Yes we have so much more space, but it is more than that. It just 'fits' - you know that feeling? I only wish we weren't just renting it but I am really hoping to be here for a while yet. So now we come to my little corner of paradise!!! Okay so it really is little but I love it dearly all the same. 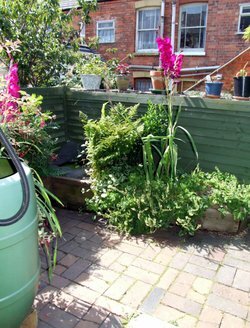 It may be the smallest garden I have ever seen but just to have somewhere to have my cuppa tea on my afternoon break from working is just bliss indeed. But I do need all the hints and tips I can get as I have never had to do any gardening before!!! I am just making it all up as I go along at the moment. The plan is to gradually each month buy more pots and boxes to go along the wall which will give us more privacy and more colour. I had no idea gardening was so relaxing and rewarding!! Okay so I have just been watering and pruning up till now but every spare moment (and there are only a few) is spent out here - mostly just gazing and enjoying quiet moments and dreaming. We even have a tiny, tiny pond in the corner! 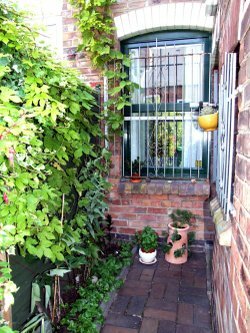 I do love our path outside the back door, with a new collection of herb pots (more gifts from my folks) and even the ornate bars on the window (I think previous owners were very security conscious). So there we have it - the mini tour of part of the new house. So there is artwork to buy, rugs to purchase, and still more boxes to unpack. But for now I really have to get down to the studio - I am busy working on new artwork which is part of an exciting new project which I will hopefully be able to reveal to you soon. Amongst wedding dresses, medieval dresses and other projects I have been finding it hard to manage my time in the last few weeks with the move but still having the studio to escape to has been wonderful. I just hope I can afford to keep it and be able to seperate my costume work exclusively to the loft space and my painting exclusively to the studio. Here is hoping!! Whatever happens I know how lucky I am to be in the position to have either one, infact I am blessed in so many ways right now, it almost doesn't seem real. I am still alive and I am back!!!! Woah!!! ~that has been just about the longest 3 weeks (??) of my life!!!! Well we are all moved into our new wonderful, beautiful and everything I had hoped it would be new home - but whoever knew it would take so long to get in a phone line and internet connection???!!! Anyway so this is just a quick hello to let you know I am back and I have missed the blogging world like crazy - I have so much to catch up on and so many blogs to revisit and find out what you have all been up to - please forgive me if I don't comment for a little while just while I am getting all caught up but I shall be visiting you nevertheless!!! So it will be back to normal blogging stories and tales tomorrow and I cannot wait! I may even have to sneak in a few photos of the new house!! !